Elegant and very comfortable holiday villa located on the most beautiful coastline on the French Riviera. 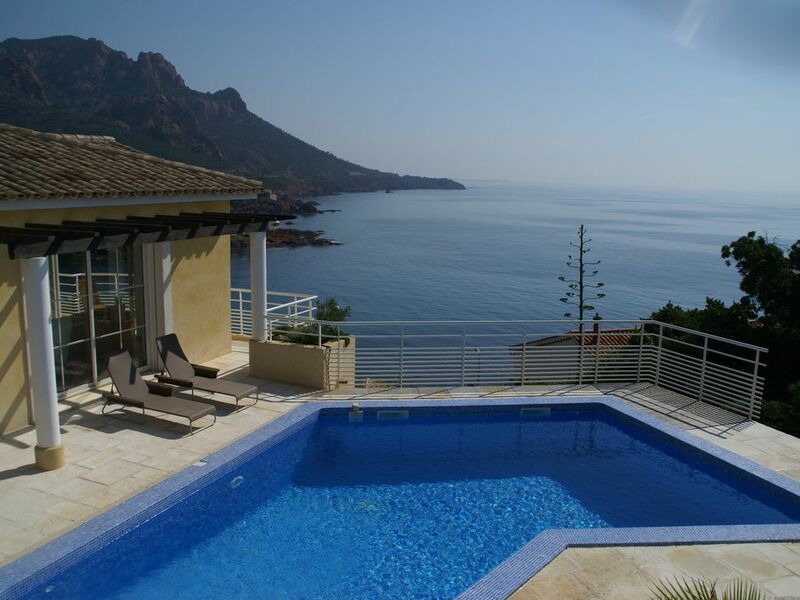 The villa, Le Paradis, enjoys a spectacular view over the red Esterel mountains, the bay and the sea from all windows. The pool is just a step outside the tastefully furnished living room/dining room which also opens up to a large balcony. The house offers a modern, American style kitchen with appliances including dishwasher, as well as a laundry room with washer/dryer, flat screen TV, barbecue, CD-player, outside dining area by the pool, lounge chairs and pool alarm. There are four bedrooms (with the same spectacular view), one with en-suite bathroom and two with bathroom outside the bedroom door. The swimming pool can be heated at extra cost. If you are looking for a breathtaking view, comfort, stylish deco and beautiful pool area - this is the place for you! Exceptional Golf Opportunities: This area provides exceptional golf just 10 minutes from the villa. Two 18-hole courses, two 9-hole courses and a golf academy make this ideal for all standards. Golf de Valescure, built in 1895, is the Var's oldest course (5th oldest in France!) A traditional 'British-style' course of 5 061 meters and par 68, this course hosts many amateur and pro-am events. Golf Esterel is an international course designed by the American Robert Trent-Jones (senior). It is 5 921 meters, par 71, built in 1989 and has hosted 2 professional European events. Leaving the pool deck and ready for activities? : The sandy beaches of Anthéor are only a couple of minutes walk away. Same goes for the small shop, two restaurants and a snack bar. There are a couple of other restaurants within walking distance of the villa and in the village of Agay with it's lovely stretch of sandy beach (a few minutes drive), you'll find shops, many good restaurants and the local market on Wednesday mornings. If you enjoy sports, Agay also offers tennis and water-based sports (sailing, swimming, water skiing, wake boarding, diving etc.). Walking/biking or horseback riding can also be done locally in the scenic Esterel Mountains. If you prefer a bit of culture why not go visit the castle Château de La Napoule in La Napoule. The castle foundation welcomes qualified artists in all fields to its residency program in which exhibitions, readings, concerts, performances, seminars and conferences are held throughout the year. We found the most spectacular and beautiful spot we had ever seen in France and the land was for sale. We just could not let it go! After a couple of years our dream house was a reality. If you get the chance to sit on the balcony or up on the top lounge terrace when the mountains turn burgundy red from the descending sun - you'll understand how we felt. This is a unique setting even for the French Riviera! Three fresh and elegant bathrooms with stylish tiles and deco. One bathroom is an en suite to the master bedroom. Garden quite slanting so outside playing is not ideal for small children. Thanks for your review. We are so happy that you enjoyed your stay in "Le Paradis" and the region as much as we do. This quiet part of the Côte d'Azur is quite a hidden gem, so we are very happy when our guests get to discover it too. I understand that it's been quite warm this summer and considering the global warming with increasing temperatures, we should definitely look into installing airconditioning. Thanks again for your feedback and welcome back! Lovely villa with stunning views. We had a lovely week here. The villa was really comfortable and most notable for its fantastic views. Fantastic view, relaxing and close to the sea! We just had to go back again and we rent the house for the second time this summer. Its location is perfect, a few minutes walk to the sea and mountains, 10 minutes by car to shops and 20 minutes by car to St Raphael and the boats to St Tropez etc. Our teenagers could come and go with the trains, the station is just next door. With a stunning view from the terrace we relaxed and enjoyed to prepare the french cuisine and having our meals together by the pool. Very nice house! We'll be back. A wonderful week that we will remember forever. The sea was so close that we swam in it every day and before breakfast on most even at the end of September. Le Paradis is a delightful house in a superb position with responsive hosts. Don't be put off by the railway: you don't notice it and it gives you access to so many places along the coast. Don't miss out on walking in the Massif de l'Esterel and just immerse yourselves in the wonderful Provencale lifestyle. We are so happy you enjoy your stay. We also can't get enough of the Mediterranean Sea and the fantastic l'esterel mountains. We hope to see you back at Le Paradis again. We spent some fantastic days in this house. The view was fantastic as well as the surroundings. A 3 minutes’ walk to the beach made it possible to go for a swim, early in the morning in the lovely Mediterranean. The swimming pool and house were of high standard and a more suitable name of the house than ”Paradise” is hard to choose. It IS paradise! A spectacular setting! What a fantastic house in the most amazing setting. The house is completely fitted with everything you might need to have a memorable time. The view from both the house and pool canopy is unforgettable. The owners are helpful and kind which makes all the difference. We highly recommend to all. Thanks Thomas and Louise, your place is exactly what we thought and then some. Marian and Carlos from California. Thanks and welcome back next year! Elegant, deluxe, holiday villa with spectacular sea view, pool and 4 bedrooms between the French Riviera towns of Cannes and St Raphael. Only minutes to several beautiful, beaches and services including good restaurants, shops, golf, tennis, sailing, diving, riding and mountain trekking in the National Park of Esterel. Other reachable attractions are St Tropez and the charming town of St Raphael with its casino and shopping district, as well as the beautiful town of Théole with its marina. This newly and tastefully decorated house has a beautiful terrace by the pool with dining area, including barbecue, and sun chairs. On top of the property you also find our popular lounge area with a stunning view over the sea and the red Esterel mountains. The house is available all year and can accommodate 9 people. Price includes gardening, pool service and cleaning at departure. This is a dream villa in a paradise setting! Payment is usually accepted in Euros unless the currency and the amount is specifically agreed in advance with the owner. Rent includes cleaning, pool cleaning and gardening after departure. Bedlinen can be provided at a cost of 20 Euros per person. A security deposit of 800 Euros will be asked for no later then 2 weeks before arrival. It will be returned as soon as the house has been checked.